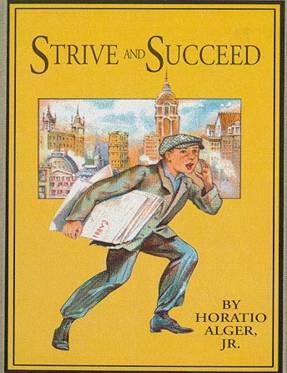 The Horatio Alger books are wonderful propaganda for the capitalist system. Northrop Frye saw through hype. It is of course true that a great deal of trash which passes as literature, or at least as entertaining reading, also articulates social myths with great clarity. I read many of the novels of Horatio Alger at an early age, and as I have a good verbal memory, a journey round my skull would unearth a great many pages of some of the most pedestrian prose on record. I wish very much that a surgical operation could remove it and substitute something better, but still Alger probably did me no permanent damage, as I was never inspired to adopt the virtues of his heroes, and this leads me to hope that the children of today may emerge similarly unscathed from their similar experiences. My best work has always started around a single franchisee's kitchen table.